It is the first dog that learns to use its feet to walk, the first dog star on board Apollo 10 spacecraft and on the Broadway stage show, You can see it smiling at McDonald's, gift shops, bookstores, even on the T-shirts, wallets or cell phone pockets. Born on the 12th October,1949, its name is called Snoopy,who loves sports, writing novels, likes to eat pizza, biscuits and ice cream. 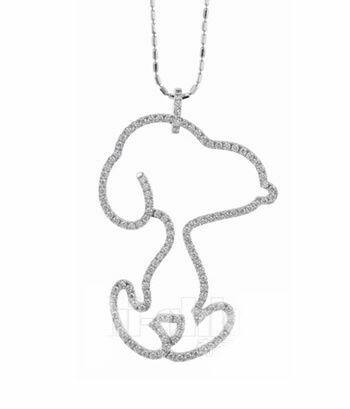 It has been poplular among the world's 75 countries, listed on more than 2600 newspaper serials, 300 million comic books, 50 cartoons, accompanied by the estimated 355 million readers.This Snoopy pendant is to celebrate Snoopy’s sixtieth birthday and especially created a diamond-studded Snoopy. This bright Snoopy pendant is named "Eternal Shining Star”, which means pure and cute Snoopy, like diamonds, constant and shining ,deeply loved by everyone! 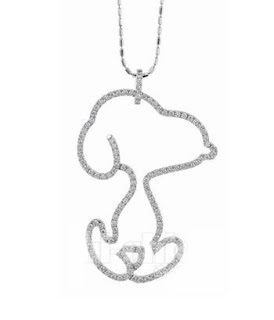 However,if you can’t afford the most diamond-studded Snoopy and you still want to wear the lovely Snoopy by you.TSL can meet your need by publishing commemorative diamond accessories,one of which is made of dazzling diamond,with Snoopy shape.It absolutely can be the essential accessory for the Snoopy fans because of its exquisite and interesting look.Two sizes are available-big one selling for 15580 dollars,while the small one selling for 6880 dollars.